In the video, Bittman rambles on about how this dish prepared in one of the restaurants of his pal Jean-Georges was his favorite new dish he had eaten all year. And you can guess Bittman probably eats a lot of new dishes each year. I watched them prepare the dish and then hopped over on the link to the recipe. What was not to like!? It was a convergence of all sorts of good things French, Asian and otherwise — raw scallops (the best kind of scallop), sushi rice crisped up in a pan, sherry vinegar, honey, soy sauce, chipotle peppers, olive oil, etc. Alex came over, I fed both our kids and then we commenced on our spicy crispy scallop dish. And all of us, too, declared it one of our favorite new dishes we had eaten all year! 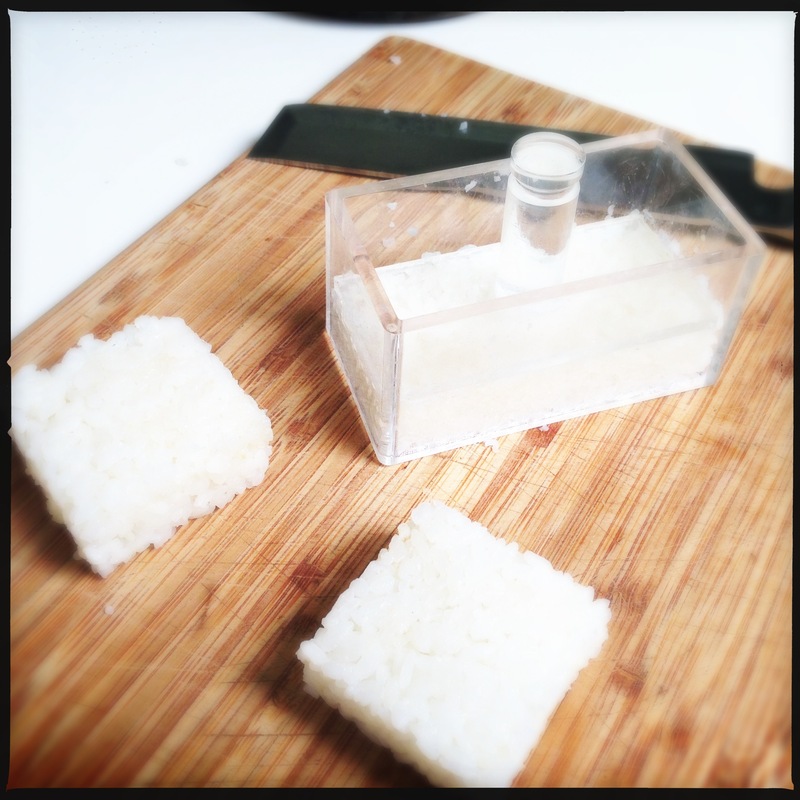 My handy sushi rice press, available at any Japanese market — perfect for making nice squares of sushi rice or for interesting plating of risotto! It is very rare that I feature someone else’s recipe on my blog. But what’s the point of having rules if you can’t break them sometimes? Though I have, as I often do, made several adjustments to the recipe for both ease and taste, I give full credit to Mr. Vongerichten — mostly just because he seems like a pleasant fellow, I enjoyed his wife’s Korean food show on PBS, and I like to try to pronounce his name. Here’s the original video if you want to watch it. If not, here’s the recipe. Enjoy! Rinse the rice several times in cold water. Then let sit for 10 minutes in cold water. Drain, and add 1 and 1/2 cups cold water. Cover and bring to a boil, let boil one minute, then reduce heat to low and cook for five minutes. Turn heat to high again for 30 seconds, then remove from heat and let sit 15 minutes. Remove lid and gently fold in vinegar and dried dashi broth. Let cool. Line a small baking dish (4-by-6-inches, for example) with plastic wrap. Firmly press the rice into the pan. Refrigerate until set. Remove the rice from the pan and, using a chef’s knife dipped in hot water to prevent sticking, cut into roughly 1-by-3-inch rectangles. Make the chipotle mayonnaise: Combine the mayo, red-wine vinegar, juices, chipotle chili and salt in a mortar and pestle and blend thoroughly. (You could also do it in a mini-prep food processor). Drizzle in olive oil, stirring constantly (or pureeing) until smooth, thick and creamy. Make the honey soy sauce: In a small bowl, combine soy sauce, honey and sherry vinegar. Stir until incorporated. Heat grapeseed oil in a non-stick pan over medium high heat. Dredge the rice rectangles in rice flour and cook until golden and crispy, about 5 minutes total, turning once; transfer to paper towels. Combine chipotle mayonnaise, scallop slices, basil and scallions and gently toss. Top each rectangle three slices of raw scallop. 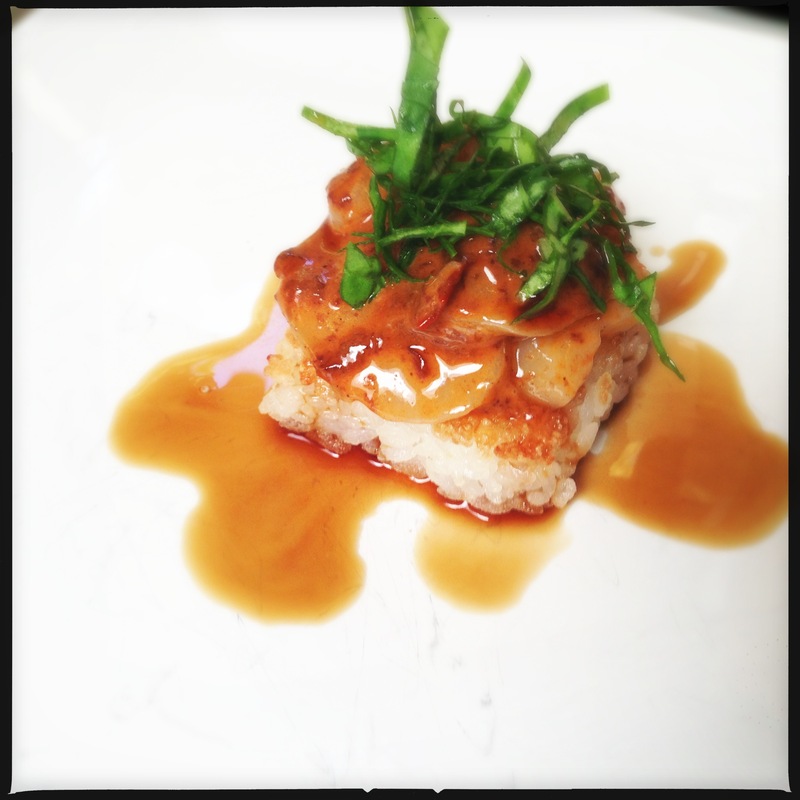 Drizzle honey soy around the base of the rice, then garnish with a few sprigs of radish sprouts and a pinch of salt. I’ve eaten many a scallop, but never a raw one. Wait, does ceviche count as raw? What a beautiful dish! Now I’m on the hunt for good local scallops. Oh man… you won’t believe how good they are raw. Ceviche counts as half raw. Make sure to get sashimi grade. Sometimes you can find them frozen in large bags, and you can keep them in the freezer for whenever you want them. I’m a New Englander so I hesitate to buy frozen scallops, but if you say they’re good I trust you implicitly. Flash-frozen from Japan, as is most of the sushi fish you eat. They’re frozen on the ship, so probably fresher than the “fresh” you’ll get raw. But if I were you, I’d be searching for them live and still in the shell. Thank you for clarifying that fish frozen on the ship is better than the “fresh” that has been sitting on (maybe enough) ice for five days, but has never seen the inside of a freezer. I would much rather eat seafood that’s been flash-frozen within an hour of being caught. Indeed! It’s the much better option, and is the case with most “fresh” fish you eat at the very best restaurants — even sushi bars. Be still my heart. I’d have been happy enough just with the fried onigiri with dab of that sauce. But yummy scallops, too? We had a fabulous meal at Jean-Georges years ago. I’d love to go back there one day. In the meantime, find yourself some fresh scallops and dig in!